Ion thrusters, the propulsion of choice for science fiction writers have become the propulsion of choice for scientists and engineers at NASA. The ion propulsion system’s efficient use of fuel and electrical power enable modern spacecraft to travel farther, faster and cheaper than any other propulsion technology currently available. Chemical rockets have demonstrated fuel efficiencies up to 35 percent, but ion thrusters have demonstrated fuel efficiencies over 90 percent. Currently, ion thrusters are used to keep communication satellites in the proper position relative to Earth and for the main propulsion on deep space probes. Several thrusters can be used on a spacecraft, but they are often used just one at a time. Spacecraft powered by these thrusters can reach speeds up to 90,000 meters per second (over 200,000 mph). In comparison, the Space Shuttles can reach speeds around 18,000 mph. The trade-off for the high top speeds of ion thrusters is low thrust (or low acceleration). Current ion thrusters can provide only 0.5 newtons (or 0.1 pounds) of thrust, which is equivalent to the force you would feel by holding 10 U.S. quarters in your hand. These thrusters must be used in a vacuum to operate at the available power levels, and they cannot be used to put spacecraft in space because large amounts of thrust are needed to escape Earth’s gravity and atmosphere. To compensate for low thrust, an ion thruster must be operated for a long time for the spacecraft to reach its top speed. Acceleration continues throughout the flight, however, so tiny, constant amounts of thrust over a long time add up to much shorter travel times and much less fuel used if the destination is far away. Deep Space 1 used less than 159 pounds of fuel in over 16,000 hours of thrusting. Since much less fuel must be carried into space, smaller, lower-cost launch vehicles can be used. Sir Isaac Newton’s third Law states that every action has an equal and opposite reaction. This is like air escaping from the end of a balloon and propelling it forward. Conventional chemical rockets burn a fuel with an oxidizer to make a gas propellant. Large amounts of the gas push out at relatively low speeds to propel the spacecraft. Modern ion thrusters use inert gases for propellant, so there is no risk of the explosions associated with chemical propulsion. The majority of thrusters use xenon, which is chemically inert, colorless, odorless, and tasteless. Other inert gases, such as krypton and argon, also can be used. Only relatively small amounts of ions are ejected, but they are traveling at very high speeds. For the Deep Space 1 probe, ions were shot out at 146,000 kilometers per hour (more than 88,000 mph). Ion thrusters eject ions instead of combustion gases to create thrust: the force applied to the spacecraft that makes it move forward. An ion is simply an atom or molecule that has an electrical charge because it has lost (positive ion) or gained (negative ion) an electron. With ion propulsion, the ions have lost electrons, so they are positively charged. A gas is considered to be ionized when some or all the atoms or molecules contained in it are converted into ions. Plasma is an electrically neutral gas in which all positive and negative charges–from neutral atoms, negatively charged electrons and positively charged ions–add up to zero. Plasma exists everywhere in nature (for example, lightning and fluorescent light bulbs), and it is designated as the fourth state of matter (the others are solid, liquid and gas). It has some of the properties of a gas but is affected by electric and magnetic fields and is a good conductor of electricity. 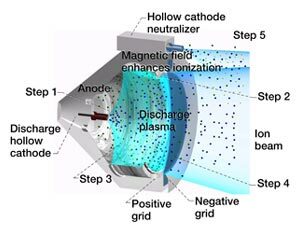 Plasma is the building block for all types of electric propulsion, where electric and/or magnetic fields are used to accelerate the electrically charged ions and electrons to provide thrust. In ion thrusters, plasma is made up of positive ions and an equal amount of electrons. NASA’s conventional method of producing ions is called electron bombardment. The propellant is injected into the ionization chamber from the downstream end of the thruster and flows toward the upstream end. This injection method is preferred because it increases the time that the propellant remains in the chamber. In such ion thrusters, electrons are generated by a hollow cathode, called the discharge cathode, located at the center of the thruster on the upstream end. The electrons flow out of the discharge cathode and are attracted (like hot socks pulled out of a dryer on a cold day) to the discharge chamber walls, which are charged highly positive by the thruster’s power supply. When a high-energy electron (negative charge) from the discharge cathode hits, or bombards, a propellant atom (neutral charge), a second electron is released, yielding two negative electrons and one positively charged ion. High-strength magnets are placed along the discharge chamber walls so that as electrons approach the walls, they are redirected into the discharge chamber by the magnetic fields. Maximizing the length of time that electrons and propellant atoms remain in the discharge chamber, increases the chances that the atoms will be ionized. NASA also is researching electron cyclotron resonance to create ions. This method uses high-frequency radiation (usually microwaves) coupled with a high magnetic field to add energy to the electrons in the propellant atoms. This causes the electrons to break free of the propellant atoms and create plasma. Ions can then be extracted from this plasma. In a gridded ion thruster, ions are accelerated by electrostatic forces. The electric fields used for this acceleration are generated by two electrodes, called ion optics or grids, at the downstream end of the thruster. The greater the voltage difference between the two grids, the faster the positive ions move toward the negative charge. Each grid has thousands of coaxial apertures (or tiny holes). The two grids are spaced close together (but not touching), and the apertures are exactly aligned with each other. Each set of apertures (opposite holes) acts like a lens to electrically focus ions through the optics. NASA’s ion thrusters use a two-electrode system, where the upstream electrode (called the screen grid) is charged highly positive, and the downstream electrode (called the accelerator grid) is charged highly negative. 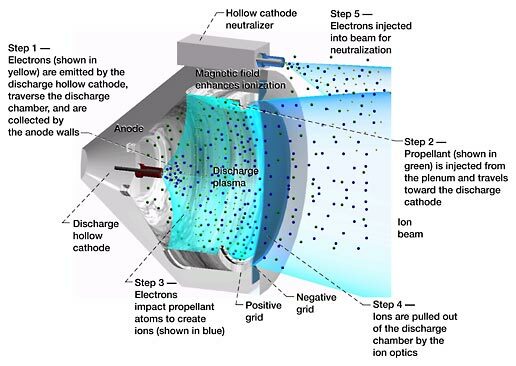 Since the ions are generated in a region that is highly positive and the accelerator grid’s potential is negative, the ions are attracted toward the accelerator grid and are focused out of the discharge chamber through the apertures, creating thousands of ion jets. The stream of all the ion jets together is called the ion beam. The thrust is the force that exists between the upstream ions and the accelerator grid. The exhaust velocity of the ions in the beam is based on the voltage applied to the optics. Whereas a chemical rocket’s top speed is limited by the heat-producing capability of the rocket nozzle, the ion thruster’s top speed is limited by the voltage that is applied to the ion optics, which is theoretically unlimited. Because the ion thruster ejects a large amount of positive ions, an equal amount of negative charge must be ejected to keep the total charge of the exhaust beam neutral. Otherwise, the spacecraft itself would attract the ions. A second hollow cathode called the neutralizer is located on the downstream perimeter of the thruster and pushes out the needed electrons. 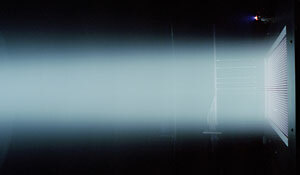 The ion propulsion system consists of five main parts: the power source, the power processing unit, the propellant management system, the control computer, and the ion thruster. The power source can be any source of electrical power, but solar or nuclear are usually used. A solar electric propulsion system (like that on Deep Space 1) uses sunlight and solar cells to generate power. A nuclear electric propulsion system (like that planned for the Jupiter Icy Moons Orbiter) uses a nuclear heat source coupled to an electric generator. The power processing unit converts the electrical power generated by the power source into the power required for each component of the ion thruster. It generates the voltages required by the ion optics and discharge chamber and the high currents required for the hollow cathodes. The propellant management system controls the propellant flow from the propellant tank to the thruster and hollow cathodes. It has been developed to the point that it no longer requires moving parts. The control computer controls and monitors system performance. The ion thruster then processes the propellant and power to propel the spacecraft. The first ion thrusters did not last very long, but the ion thruster on Deep Space 1 exceeded expectations and was used more than 16,000 hours during a period of over 2 years. The ion thrusters being developed now are being designed to operate for 7 to 10 years. Well, An idea that I send to NASA and all over the Internet is, what if we could combine an Ionic Drive with an optical laser beam ‘Repercussion’ effect? That is, when DARPA was experiemnting with laser weapons, they encountered a problem called ‘repercussion’ where you you would shoot a laser rifle at a reflective mirror or surface a mile away, and the refracted laser light would ‘repercussion’ through its length and knock the laser rifle out of your hands. So perhaps be instaling a similiar laser device on the exhaust of Ionic drive systems, the laser ‘repercussion’ effect could push the ionized Xenon atoms miles away in a very straight action/reaction alignment (the vacuum of outer space tends to disperse rocket thrusts sidewise) for an unprecidented speed and fuel efficiency in such applications. Over all it is a nice idea. The dispersion in space occurs only due to pressure difference. Since there is no pressure difference, ion jet won’t be dispersed sidewise.. If Mr. Bruce is reading this, kindly contact me for a possible investment in your research. stanley Hammerton, My email is stanleyhammerton@gmail.com.